One of the first recreational areas in Jacksonville was Ragsdale Park. Ragsdale Park was located on Ragsdale Creek NE of what is now the Tomato Bowl and North of the railroad track. At the time of the Park's inception the Tomato Bowl did not exist. In the background of this picture you can see what was The Old East Side School which was located on the current site of the Tomato Bowl. 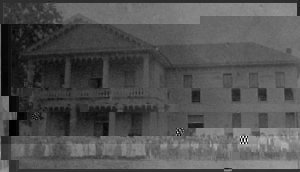 This school was completed around 1912. Thus this picture was made 1912 or later. Old Eastside was still in use in 1936 when my mother quit teaching to marry. 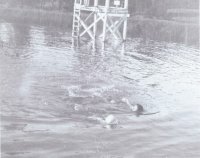 The Cherokee Plunge was the old swimming hole in Jacksonville in the latter twenties. It was located in the Pine Hill area (Hillcrest Edition) close to the Sam A. Cobb house on Hillcrest, and was fed by Ragsdale Creek that runs through the edition. The swimming facility/golf course were a private venture built by the Coats family. The entrance to the recreational facility was off Canada Street. The golf course wrapped around the swimming hole with the first tee in the vicinity of the Bob Greg home. An underwater platform served to create a shallow area on which tots could play. One of the local ministers was extremely opposed to the idea of mixed bathing. He was responsible for having a chute (privacy fence) built so women could exit the bath house and enter the water without being seen in their bathing attire. however, the creek that fed the plunge and surrounding mini-falls were a favorite haunt of the neighborhood kids. The Cherokee Plunge served as the local swimming hole after Ragsdale Park, located North of the Tomato Bowl , and before Love's Lookout. Greg Smith, TomatoCapital.com, has Ragsdale Park images online. If you have information to share regarding The Plunge, please contact me via the site contact forum. I wish I wish to thank Mary Taylor, Barbara Crossman, and Shannon Cobb for supplying photos and information concerning The Plunge. One landmark of downtown Jacksonville is the Bank Clock that stands on the corner of Main and Commerce. Though the clock has always resided on the corner of Main and Commerce it switched sides of the street when the Bank moved from the south side of the street to the north side. The clock was purchased by Mr. Parish, president of the bank, in May of 1914 for $800. Mr. Parish once lived in the house which was purchased by members of my family in 1923. Interestingly enough he later lived in Austin, Texas in the neighborhood in which a cousin lives. I have seen several similar clocks over the years. One of which is located at a building on the square in Seminole, Texas. Thad Ray had a lake located behind the Texas Basket Factory at the corner of Myrtle Drive and Burma Road. Greg Smith states it is show on a 1914 map as Resevoir #2 As a child I was fascinated by the lake for it had the only water wheel I ever had the pleasure of viewing in person. Old marker at ths site shows the water supply was established in 1915 when M. L. Earle was the mayor. Other councilmen included J. M. Pressler, W. L. Dublin, M. P.Alexander, T. E. Gillespie, C. R. Nunally, O. L. Alexander. The old mill house was probably designed by S. W, Ray, (Sidney William Ray) who did architectural work for the city and designed the old Cith Hall/Fire Station located at NE corner of Ragsdale and Rusk street where the bank now stands. Other owners of the cite include: S. W. Ray, Thad Ray, a Mr. Robinson, father of David, Robinson, and current owner J. T. Dorman . I remember the lake very well. We swam out there when I was a kid. I also remember snakes. It's a wonder how we survived without government to protect us. But actually I remember it as Uncle Sid's lake. That was Thad's older brother. He was an architect and built a number of buildings in Jacksonville. He bought it from the city, and according to my Mom, he did that before she was a teenager. She was born in 1911. He also built the stone building. She didn't know if he built it for the city, or after he bought the lake. I certainly remember the building, and of course it was in much better shape then (1940s and 1950s). I also remember the water wheel. Since you sent no pictures of it, I assume it is long gone. I do not remember the stone marker, nor does my Mom. I think Thad must have bought the lake from Uncle Sid (Sidney William) about 1960 or maybe even earlier. I know Thad sold it before he died (1976). We don’t remember when, or to whom, or for how much. But I guess you found that in the county records. But I remember thinking at the time that somebody got a steal, and wishing I had known he was going to sell it. During the days of the WPA several native stone rock work projects were completed. These included the Tomato Bowl, The Sea Scouts boat, and the rock work around Love's Lookout. The highlight of the Love's Lookout work was the amphitheater built on the side of the mountain. The theater was the site of many civic activities including the ecumenical Easter Sunrise Service. Someone who did not own the property sold the timber below the theater. The roots of the timber helped stabilize the mountain side. The timber removal resulted in the amphitheater becoming unstable and partially sliding down side of the mountain.